A friend I worked with once gave me a Ciro-Flex camera which was broken. The shutter was jammed. . I took it apart and got it working. However, upon re-assembly a spring went shooting off into the world of living room space. I searched for well over an hour, finally giving up, telling my son that it will turn up eventually. I expected to find it in the sweeper bag at a later date. In the meantime, I searched the web for another Ciro-Flex. I was impressed with how easy the controls were to operate. I found four on EBay and won a bid. It turned out to be a Graflex Ciro-Flex, otherwise an exact duplicate of my other one. What I have found out since then surprised me. The Graflex Ciro-flex is a joy to use. It is a fun camera, that if stopped down a bit will surprise you with exceptional quality images. The screen is much brighter than my Rolleiflex and my Rolleicord, though not quite as bright as my Ricoh 66 Automatic. It is however plenty bright enough to work with. If anyone is interested in TLR photography, and wants a camera to use, or even display on a shelf; the Graflex Ciro-flex is a good camera to start with. 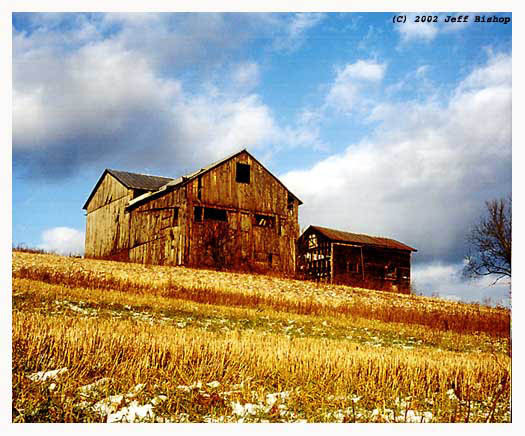 The above photo of a barn in North Central Pennsylvania I photographed on my way home from Thanksgiving Holiday with the Graflex Ciro-flex. The image is a poor scan, but even so you can still see the quality of the resulting image.I believe I used Fuji Reala 100 for the barn photo. If anyone needs any information, or has any questions concerning this camera, check out the Ciro-Flex Forum or feel free to contact me at the address below.